The works on the construction of the Palilula Green Market are close to completion and are expected to finish in late May. The workers are currently setting up the facade, and installation works are being carried out in the facility's interior. As they said at the Belgrade City Markets, once everything is completed, the competent commission will examine the facility and carry out the procedure of the obtaining of the exploitation permit. The traders themselves will certainly welcome this, as they have been selling their goods at an improvised market in front of the Fifth Belgrade Gymnasium since late 2017, when the works started. Of course, consumers should be happy too. According to the statistics, the Palilula Green Market is visited by around 400,000 people each year. 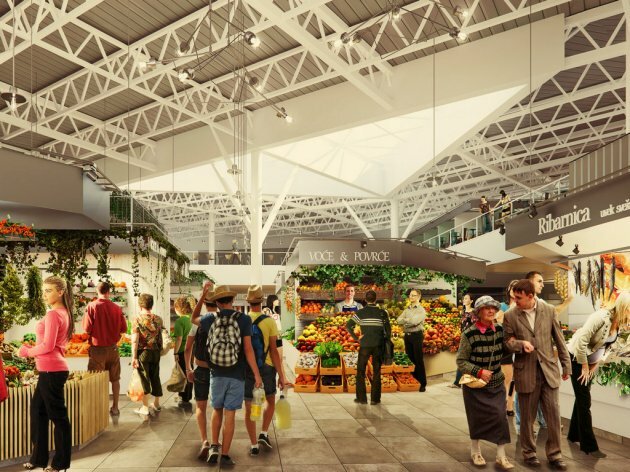 The new green market will feature modern stalls, and there will also be a butcher's shop, a bakery and a large supermarket. – The gallery will feature additional sales space, meant primarily for the sale of Serbian souvenirs, home made products and antiques, and it will also contain a larger restaurant and a cafe – the Belgrade City Markets announced earlier. The total area of the facilities being built on the triangular plot of land is around 12,000 sqm. The Palilula Green Market is the biggest BCM investment so far. The design and the construction are said to be worth RSD 1.35 billion, but the true value will only be known once all the works are finished.